Blogpost 2 about the album "Moon Light"
Hi, as promised here the next chapter of the story of the making of "Moon Light". The song "Change". The first song of the album. It must have been summer 2017 that I was on tour in Sweden and Norway and that I set by the fire at lake Unden. I had some days off and I never stay somewhere if I can stay somewhere else where it is better. And this place 'Tivedsbadet' is such a camping / public area where it is allowed to put your tent close to the lake and make fire. What does a man wants more? That evening it was quiet and the moon was rising and her light shone over the water. A breeze moved gently the branches of the pine trees. Later a stronger wind came from over the lake and lighted up the fire. I took my guitar and started to play some chords without a need to write a song. Those moments are for me like cream on my coffee, like cherries in the yoghurt. While I was sitting there, in a sort of a paradise, I got a strong need to share my feelings and longings with someone I love. At the same moment I felt loneliness and sadness because I could not share with her the rising moon, the fire, the wind and the time. It is like having a party with yourself. At the same moment I felt loneliness and sadness because I could not share with her the rising moon, the fire, the wind and the time. Perhaps you think that I am a loner or that like to be often on my own. The truth is the opposite actually. Yes, I can live on my own, even spend months in a cabin in the forest. But a chat, a talk, a glass of wine, something to eat and friendly people around me is for me not a punishment at all. I enjoy good company. Questions came up. Why are you not here? Why can't you be with me. What is it that you can't enjoy the same happiness and fantastic nature here with me? Why are we 2000 km away from each other. Do you know that all what I experience now is also available for you? You could see the moon, hear the wind, feel the fire and spend time here instead of where you are now. I knew the answers on those questions and I knew that I couldn't change you and I had to accept it. It is like it is but I can't live with it. I love you but I can't share my life with you. I looked to the moon, felt the heat of the fire, I sighed deeply, cried, prayed, hoped. Hoping for a change that would make it possible that you travel with me. A change that would make it possible that you could swim in the lake again and sit with me by the fire. That we could spend time on the road together. A change. That you could sit with me by the fire. And then my guitar (perhaps my biggest friend) helped me to bring my feelings into words and melody.
" The man in the darkness, he is dancing in the moon, light "
The second song on the CD "Moon Light" is about somebody I met last springtime in Yorkshire. The song is live recorded in a beautiful take with Asya Pritchard. This year in May/June I go to Ian to meet again and to do a concert. I am really looking forward to it! The concert is planned on Saturday Night June the 1st 2019. From my tour blog "Wood Tour"
I arrived in the very early morning time with the ferry in Dover. From there I took the Motorway up to Bradford in Yorkshire. My plan was to visit the Folk Club on Thursday in Bradford. Because I don't prepare my journeys in detail I found by 'coincidence' a campsite called “Aarons Camping” in Cragg Vale. On very narrow roads with walls on both sides I climbed to the top of a hill where the camping is situated. Following some signs and keeping left I arrived at the camping; a meadow with no signs or numbers. I was happy and surprised about what I saw, because I like campings where people are not pushed into boundaries. Often people flee from their homes and cities to find some freedom and space outside but most of the time the owners of the campings frame them again in structures. I met Ian, the owner, a middle-aged man, and asked him if I could stay there with my tent. Well that wasn't a problem of course. After installing myself I went back to him to pay and to get some wood for a fire. The owner explained me several things about his camping and his land and I was actually very surprised about what I heard! To listen well is not always easy for me and especially not when someone tells me things that let my thoughts drift away from the conversation and reality. So it took a while before I fully understood what he had told me, and that was a lot. With all that in his mind he started with planting trees to restore the land and environment and to bring back what had been lost. Ian Aaron King, that's his full name, told me that he inherited the land years ago from his father. The barren land was empty. No house or trees. One of the first things he did was making a start with planting trees with the history in his mind. Ian told me that since the time of Robin Hood landowners, kings and rulers cut down a lot of forest not only because they needed the wood. It was, like it happened in Scotland also, policy to wipe forests out to take away the living from the free people. No forests meant no wood for houses and fire, no game to hunt. And centuries later there was the industrial revolution that gave the grace blow to the forests in England. With all that in his mind he started with planting trees to restore the land and environment and to bring back what had been lost. “Well the people here in the region were scornful about my planting trees but I knew this was the best to do. Perhaps not for me but for the next generations.” Ian said. Wow, that was impressive to hear. Not someone who only complaints and points the finger to the others or to the government but who tries to make the difference. That night while I was sitting by the fire in front of my tent I started to work on a song about Ian who plants trees. On Thursday the weather was typical English with some fine rain and mist. I had the plan to go to Bradford to visit the Folk Club. 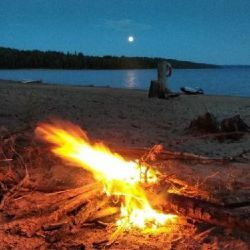 But I could not find the need to go away from the camping and the idea of having a nice fire again in the evening time was winning. I had another talk with Ian. He showed me his house and barns and he explained that it was build of stones of an old church close by. “They were demolishing the church and I could use the stones for my house and so I asked if I could have them instead of that they would become pulverised. And that was okay. So here it is. My house built from church stones.” Said Ian proudly. He told me that he was songwriter and showed me in one of his barns poems and songs of heroes like Robin Hood and the Cragg Vale coiners. He told me that he wants to keep the stories alive to make people aware of injustice in the past and what we can learn from it for the future. And again I was impressed by what he had told me, Truly a man with a good heart and who fights for a better world. Truly a man with a good heart and who fights for a better world.